I was not in a colorful mood. So this piece will linger on the boards for a while before I get back to it. I came back from a number of trips last month with a swarm of images floating through my thoughts but no map to figure out how they go together. It was frustrating to feel so aimless. I looked around at the work that I had done prior to my trips and felt totally disconnected from them. After a few days and a number of puzzled thoughts I decided to be radical. I took out all of my older pieces lurking under the studio tables and made some judgements. Some still spoke to me about their intent and focus. Others did not. 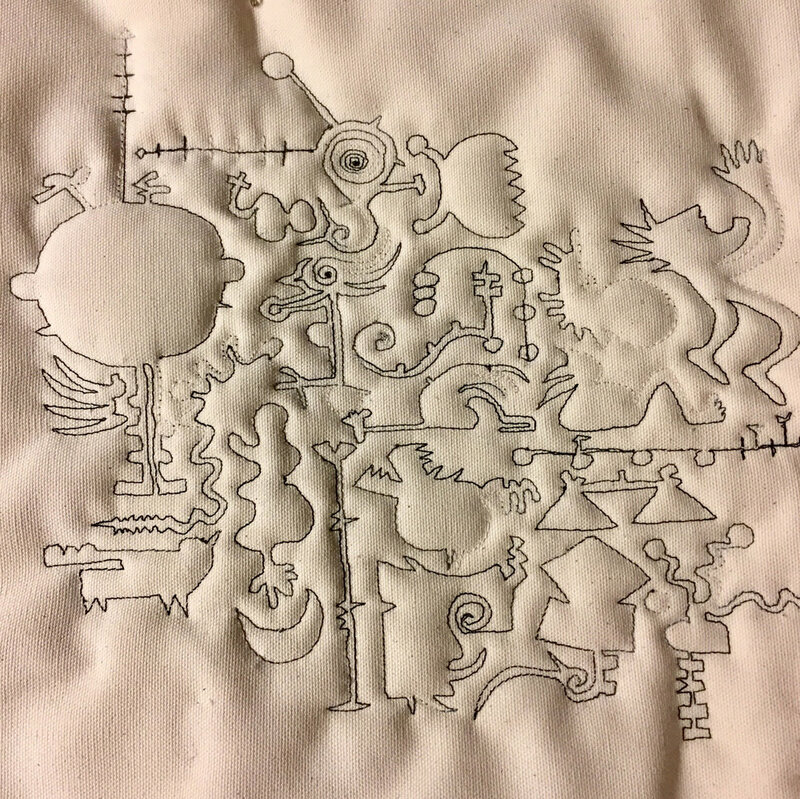 Some showed a learning curve in the stitching that no longer represents my work. Others were pieces that didn’t get done. This piece never got done. It was an experiment with geometry and connections. I chose a few and laid them out on the cutting board for some fun with rotary cutter. Fun with my rotary cutter. No piece is sacred. This piece, called Keeping up with the Dow Jones, was done in 2009. I’m over it. Just that act of cutting up several pieces into 2.5” squares was a release from the aimlessness. I wasn’t sure where I was going to go with it but I knew it was the right step. Catharsis. Resolve…and a little panic. After some mix and matching, twisting and turning I finally came up with a composition that seemed to hold together. I stitched the squares onto a canvas backing. All 420 of them. And now the fun begins. My goal as an artist is to channel what is invisible into the visible. The work I do is intuitive and exploratory. I’m never quite sure what will result with a piece like this. I just know that I am channeling lots of different emotions and thoughts. Beauty, complexity, doubt, anger, worry, whimsy, calm and depth. They are all in there. The layering of stitch and fabric brings out the best (and worst) of me. I’m going to call it Many Moons. Because that’s how long it will take to finish it and because its taken me many moons to get to this stage in my work. Hot. humid brain. Clouds too full to stay afloat. No focus. Time to walk away from existing projects. Instead, I had a quilt camp week. Two very promising artists participated. 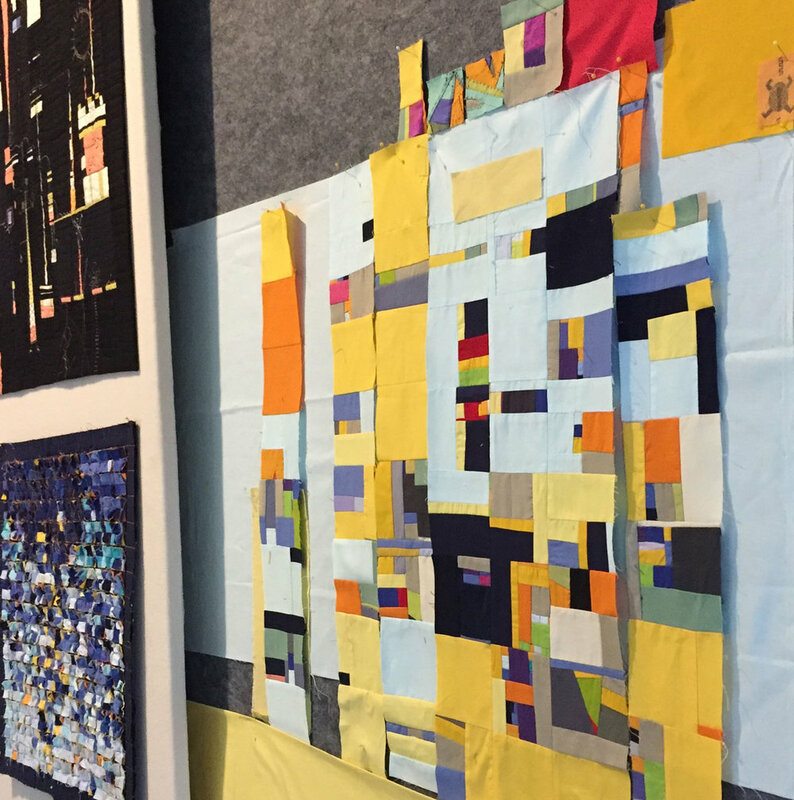 We talked about modules, grids, color theory, stitching and machines. 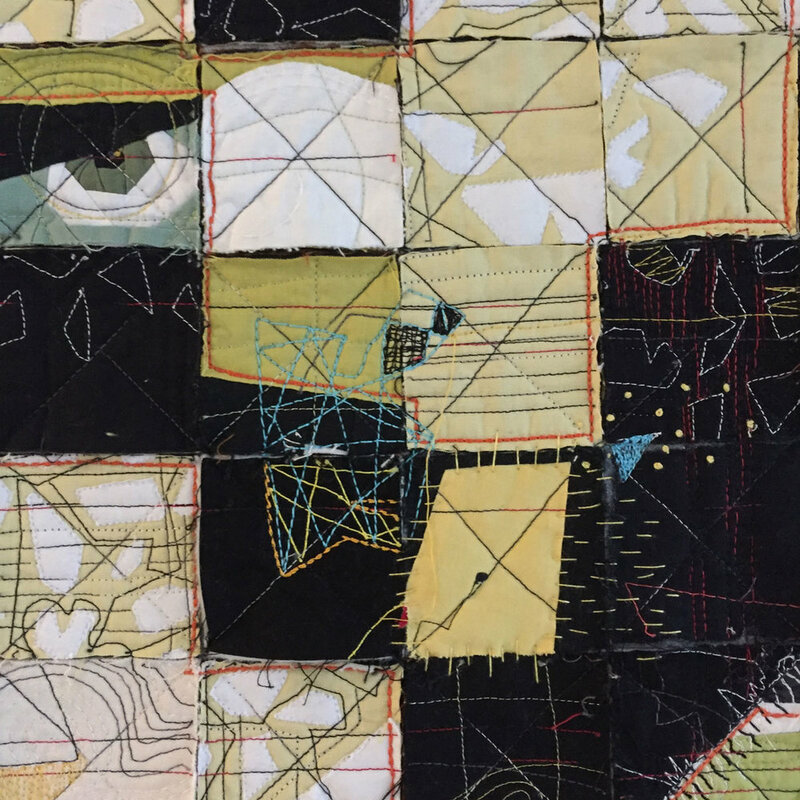 They both learned how to build compositions from scraps, thread the machines, trim their work with a rotary cutter and stitch with a free-motion foot. 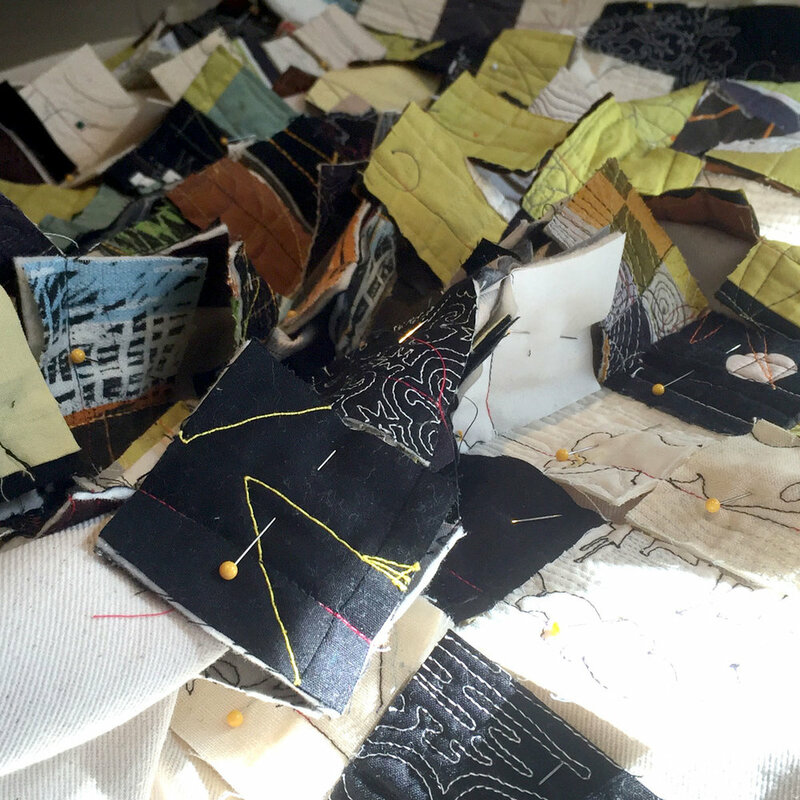 The terms strip piecing, log cabin, and machine appliqué now have meaning to them. They followed the rules and broke the rules. As they should. Did I say promising? No. These boys had it going on. They fell into the slipstream of stitching with no fear, no preconceived notions and a willingness to learn. On the sideline I played with their leftovers to create this blue state red state composition. And since I was a bit pre-occupied with making sure that they were safe I had to work fast and without boundaries or rules. No seams, no careful stitching, no worries. I may pursue this practice a bit. I have bundles and bundles of scraps to consider. After they left I pursued some of the work I had already begun. A new Glyphs piece (see another Glyphs piece here). These glyphs have bodies. Meanwhile, I watch too much TV news is sitting in my hand-stitching chair. Using a needle to poke into that fabric roll is satisfying. Like a little voodoo panel that lets me get away with commentary. I'm scattered but productive. Confused but dogged. Doubt-filled but determined. Fuzzy-brained and seeking clarity. 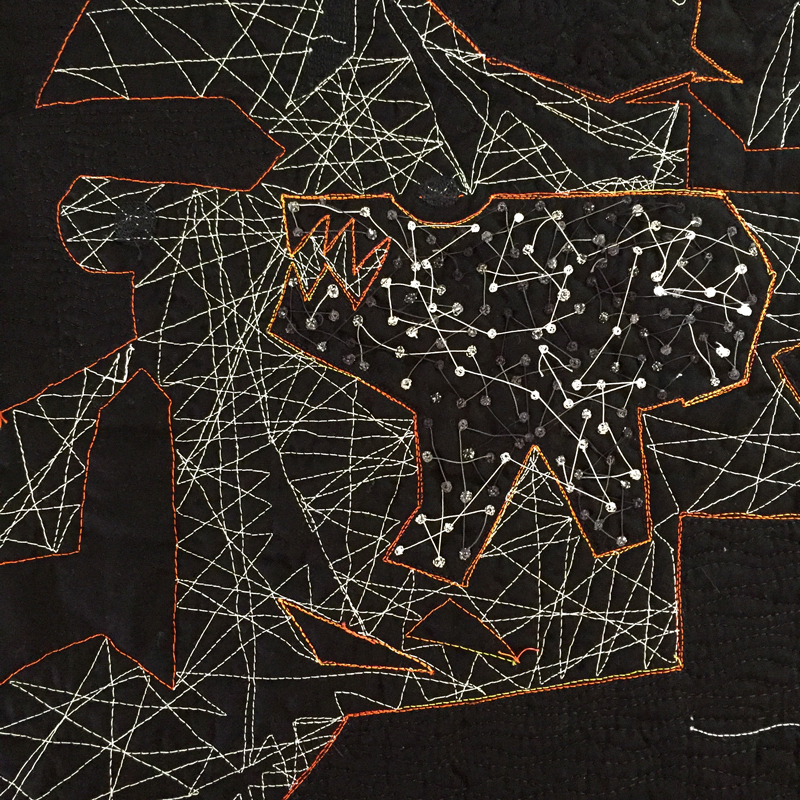 I stitch all day on the front side of my quilts. The journey from idea to final is often full of surprises. I look for that in each piece like finding a needle among pins. These blocky forms cry out for some textural details. So when I started this piece, now called Disruptors, my focus was on the front. The images are strong geometric shapes with details that look like animals or confused beings. My challenge is to bridge the blocky forms with line work that makes sense. How does one fabric, color or texture relate to the next? Where are the direction lines in the composition? What would texture do to make this piece stronger? Where can I add an element of continuity without sacrificing the chaos that I am going for? Bridging gives structure, action and depth. I started here by outlining the blocky shapes with a bright orange thread. Then did some ricochet stitching in the white areas of the piece. By ricochet I mean that I travel across a space until I hit an imaginary barrier than pivot and do the same until I hit another. It's like a ping pong ball bouncing in an empty room. The texture often ends up being an assemblage of triangles. Those complement the triangles in my print. Each character in this stage has a unique personality. So I decided to use a different texture in each element. Easy right? The variety of the shapes and textures added to a sense of chaos and disruption and the orange thread pumped up the drama. I thought I had it. The textural differences in each character adds depth to the piece. And then I turned the piece over to clean up any loose threads. Oh my. Hello stranger. where have you been these past two weeks? This is the back side of the second image in this post. I'm loving that orange/yellow line. There are always two sides to every stitched story. I am entranced by this one. I am even willing to sacrifice the front to continue on the back. I'm not sure what this side is telling me but I will continue to build on it before I end this journey. Perhaps the message will emerge. Repeat after me. It's process not product. It's process not product. It's process not product. Each day that mantra challenges me to let go and dive in without expectations, without end goals, without success or failure. So this past week has been all about play. I have been slicing, dicing, scribbling and tossing things around without much success but with a whole mountain of possibilities. It started with the rotary cutter. After sorting through all of my finished and unfinished work last month in preparation for a couple of exhibitions in 2018 I realized that not only do I hoard work but I also experiment a lot. Which means I would have to make another trip to the local Depot store for yet another plastic bin to stack up under the (already overloaded) table. Which brought me to the realization that I do not really need new materials. I already have a excess of fabric and stitches to start new pieces. So, I have a new law: nothing is sacred. Well maybe I should qualify that: some things are sacred, but not all, no matter how many hours I had put into it. I combined a lot of the pieces into a scrap explosion. Blech! I hate this. I really hate this. Where is my rotary cutter? 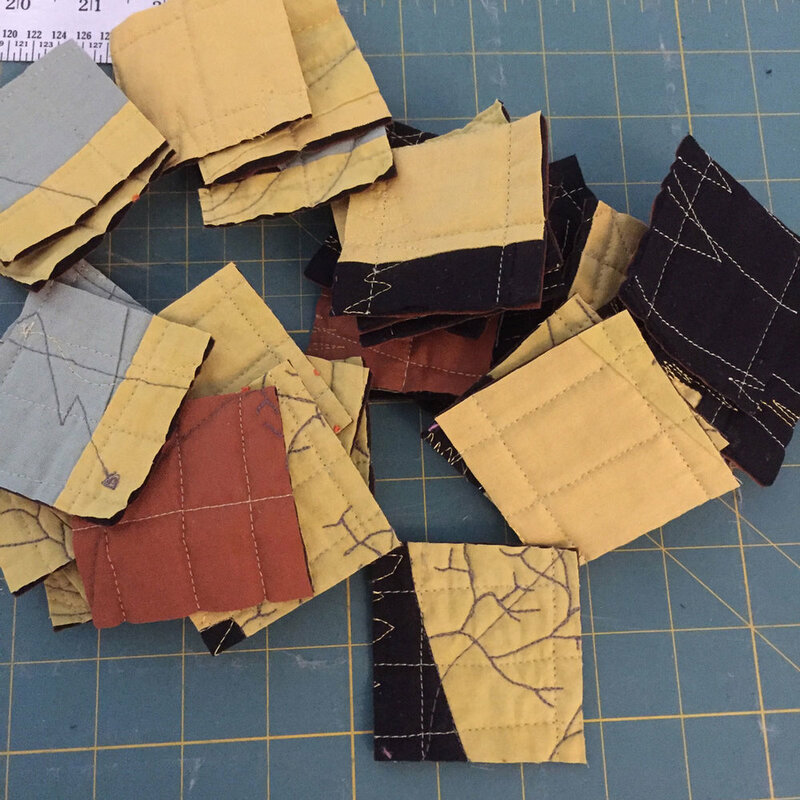 After cutting up the cut up pieces I started with new fabric to create a composition that would included the textured pieces. Then I got this wonderful piece of striped fabric from a second hand store and couldn't resist taking the composition one step farther. Same color palette, new texture...what could go wrong? Ok, maybe 2 or 20 steps further. I am removing fabric pieces in the original composition to let the stripes bleed through. I use this mighty tool to deconstruct pieces that don't speak to me anymore. I look for those quiet ones that seem unbalanced, pretentious or unsuccessful. They hide in piles beneath my work table — murmuring. Some are sharing false narratives. Some seem to be trying too hard. Others just plain bore me. So I get out the rotary cutter and start cutting. I'll often end up with a pile that stretches to fill my entire work table. I try not to think about how many hours were spent creating the pieces in the first place. It's about the process not the product right? 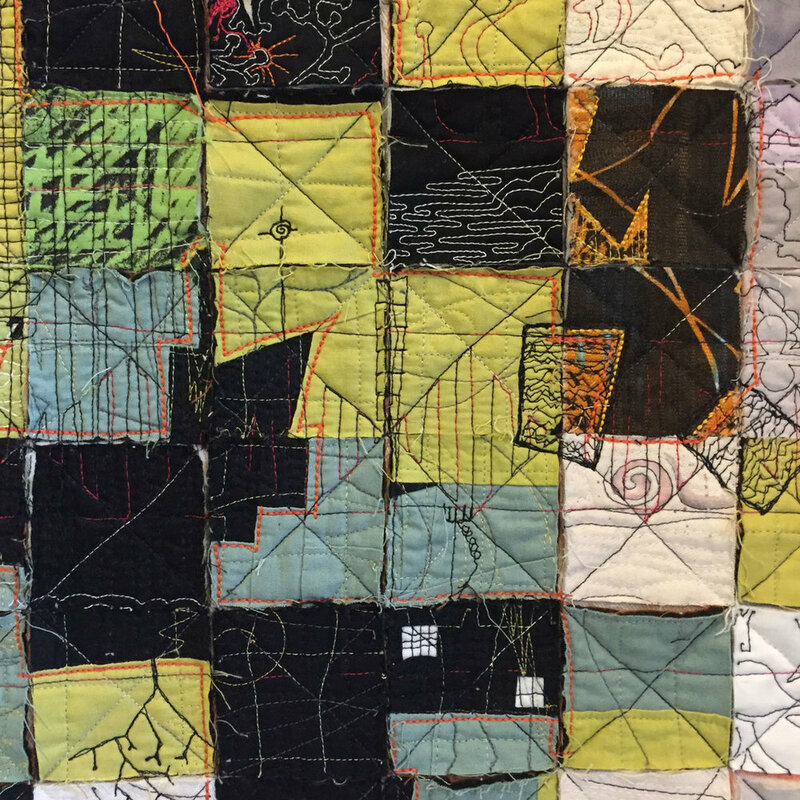 The varying stitch, cloth and colors create an animated surface. 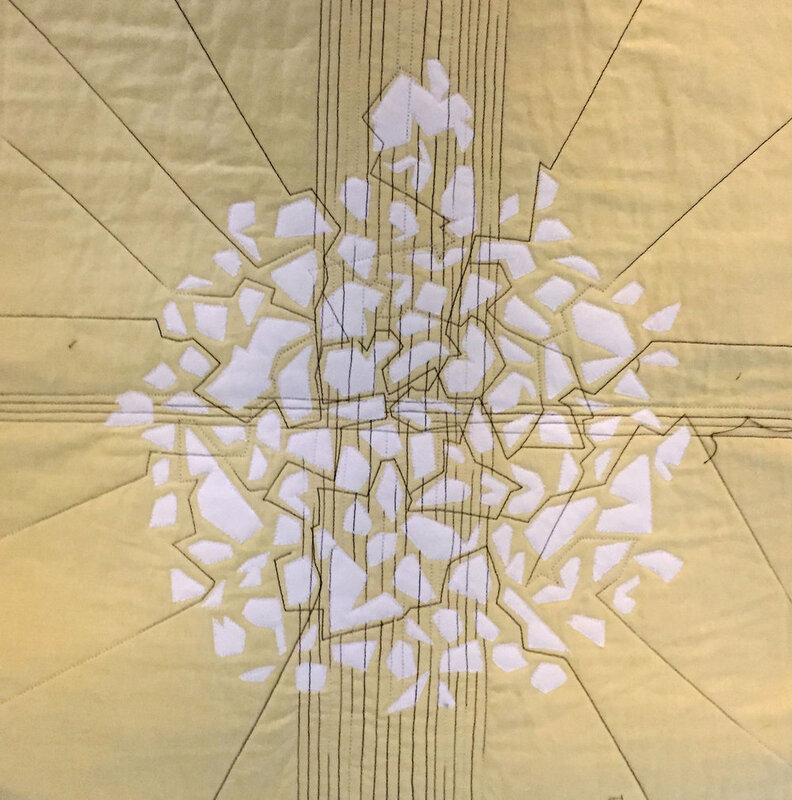 Then I start stitching again, connecting the diverse pieces to each other by adding another layer of meaning to the story. And then I add some more. Until it seems to be enough. 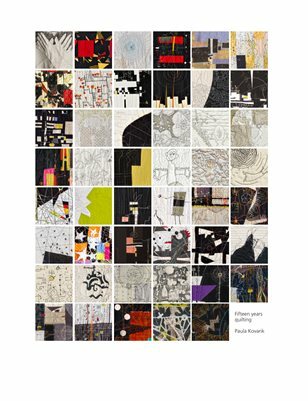 A newly published record of my work over the past fifteen years. 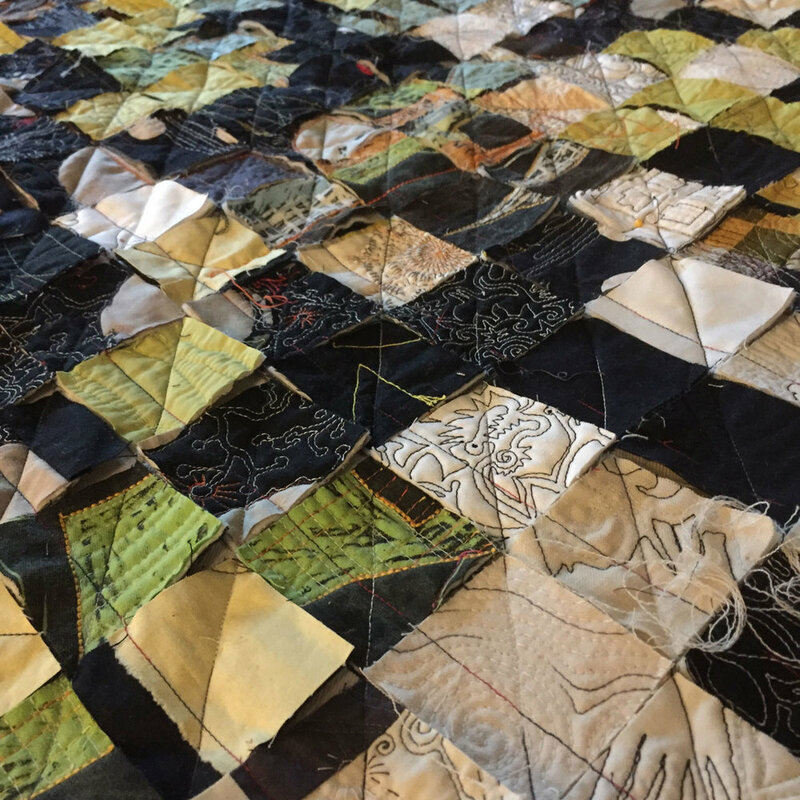 Order a copy of my portfolio, 15 years quilting at MagCloud. ©2018, Paula Kovarik. All rights reserved.